Following on the successful symposiums of the Early Caribbean Society (ECS) held in Barbados in 2011 and Puerto Rico in 2012, the ECS will host its third symposium in London, England to promote the study of early Caribbean literary history. The symposium will take place immediately following the Society of Early Americanists conference on “London and the Americas, 1492-1812,” which will be held in London on July 17-19, 2014. Attendees can sign up for the SEA conference, the ECS symposium, or both events through one registration process. The SEA conference and the ECS symposium will take place on Kingston University’s campus in South West London, a 25-minute train ride from central London and a short bus ride from Heathrow Airport. Housing options will include university dormitories as well as a diverse array of local hotels. Plans for outings are in the works. Proposals are invited for 20 minute papers that address any aspect of early Caribbean literature, culture, or literary history. Given the location of the third symposium, we particularly seek papers that consider Atlantic networks, currents, and influences. 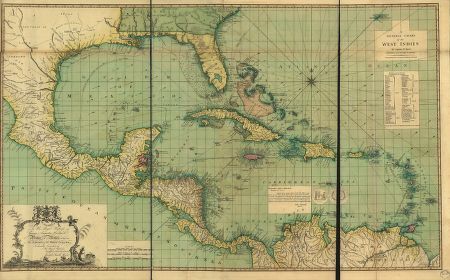 Papers might address the movement of people, ideas, and commodities around the Atlantic and the Caribbean, the material and ideological impacts of European colonization in the Caribbean, and/or the literary construction of the West Indies. Papers might also consider how actual and imagined experiences in the West Indies transformed cultural practices, habits of consumption, and scientific, religious, and/or philosophical discourses in Europe. Persuasive communication has been at the heart of much of Western social and political development. It played a crucial role in the early promotion of colonization, the struggle for independence, the campaigns for the recognition of independence by European powers, the making of the constitutions, the foundations of the new states, the justifying or repudiating of slavery, and the building and manipulating of alliances with Native Americans. Several decades of scholarship have elucidated the dynamics of authorship, publishing, and reading in the Americas and the Atlantic world as forms of public relation practice in the pre-mass media world. Meanwhile, numerous studies of public opinion have built upon and responded to Jürgen Habermas’ thesis about the transformation of the public sphere in the eighteenth century. These two strands of scholarship have often intersected, and, in both areas, the scholars have insisted on the need to move beyond the reified notions of “print culture” and the “public sphere” to consider the interaction of oral, scribal, printed and behavioral forms of socially and politically motivated communication. The 2014 EEASA Conference will provide an opportunity to present fresh and more nuanced insights on how political communication actually worked in the Americas and the Atlantic world. What strategies of communication and modes of persuasion and protest did people develop and with what goals? What constraints – technical, geographical, legal, or cultural – help to explain the adoption of certain forms of expression and the content of the messages? How did the meaning and significance of words and images evolve as they traveled from place to place? How were persuasion and protest articulated in non-verbal forms, such as gesture, symbol, image, and performance? What political consequences – intended or unintended – resulted from the way people used speech, writing, print, and group action in early America and the Atlantic world? - group protest tactics: petitions, marches, town and country meetings, activist organizations, etc. The John Carter Brown Library will hold a conference entitled “Sugar and Beyond,” on October 25-26, 2013, in conjunction with the Library’s Fall 2013 exhibition on sugar in the early modern period. We seek three to four additional contributors to fill out an interdisciplinary special issue of Atlantic Studies, guest edited by Toni Wall Jaudon (Hendrix College) and Kelly Wisecup (University of North Texas). In recent years, scholars of the early Atlantic world have begun to recognize the inseparability of religion and science in the period’s literature. So, too, have they begun to attend to the alternative forms of knowledge and power that consistently shadowed and undercut these binaries. This special issue will engage these conversations by focusing on eighteenth- and nineteenth-century representations and manifestations of obeah, an Afro-Caribbean religious and medical complex that played a signal role in confounding distinctions between religion and science. Often associated with slave rebellions and other, more local disruptions of colonial order, obeah appeared in literatures and histories as a protean and subversive force, one that repeatedly blurred boundaries between natural and supernatural powers, rational and magical explanatory systems, and spiritual and medical healing practices. The special issue challenges scholars to rethink the geographic frameworks defining their fields, for obeah’s origins and its influence extended to Africa and India and the people, ideas, and plants from these places; obeah thus requires both local and global units of analysis. As such, it offers a compelling site at which scholars working from a wide range of perspectives and disciplines may consider how their fields intersect and what their various disciplinary tools illuminate about obeah and its literatures. Submit one page abstracts and CVs by April 1, 2013, to jaudon@hendrix.edu and kelly.wisecup@unt.edu. Complete essays will be due in late 2013. Inquiries also welcome. Essays of about 7,000 words will undergo the journal’s usual peer review process. Abstracts of 250 words should be sent to Dr Rachel Douglas, Rachel.Douglas@glasgow.ac.uk by 15 April, 2013. Keynote speakers will include: Professor Robert A. Hill (UCLA and C.L.R. James’s Literary Executor), Professor Nick Nesbitt (Princeton), and Dr Matthew J. Smith (University of the West Indies). Further keynote speakers to be announced. The Early Caribbean Society invites proposals in which papers explore any aspect of how experiences in the West Indies gave shape to new practices in the eighteenth century—of science, medicine, writing, gender performance, beliefs, etc. Recent ASECS panels have included individual papers that have explored some of the ways that experience in the West Indies has influenced trends or developments elsewhere in the Atlantic world. This panel seeks to gather several papers addressing these phenomena and spark further inquiry and discussion about the place of the West Indies in eighteenth-century culture. The Early Caribbean Society invites proposals for papers that explore any aspect of travel in or around or to or from the islands of the Caribbean. Topics may include exploration, trade, war, piracy, the slave trade, or any interactions between the West Indies and other regions of the world. Standard format papers are welcome, but proposals for jointly-written papers or other innovative presentations will also be entertained. "Dimensions of Empire and Resistance: Past, Present, and Future"
On May 14-17, The American Studies Program at the University of Miami presented ATLANTIC GEOGRAPHIES, a 4-day institute for advanced graduate students and recent PhDs at the Elena Díaz-Versón Amos Conference Room of the Cuban Heritage Collection and the 3rd-Floor Conference Room, Richter Library, University of Miami. Keynote lecture and workshop were by Vincent Brown (Professor of History and of African and African American Studies, Duke University).